Give your staff an instant reference of what to do in case of a fire. 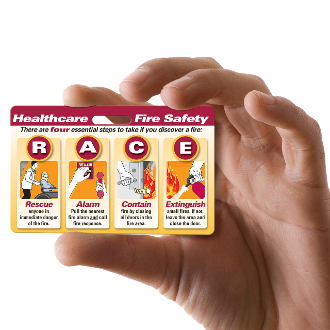 RACE/PASS Mnemonic instruct staff on what to do immediately when they encounter a fire. Improves fire safety training compliance with regulatory agencies. Great for your physicians and agency staff who don’t always receive the same training as your staff. Badgie™ Cards attach directly to staff ID badges and lanyards, serving as a constant reference and learning tool. Quantity: 25 cards per pack. Imprint: Full-color graphics (front and back) and finished with gloss lamination, side slot and rounded safety corners. .30 mil thick.